Using any convenient browser (even the tiled version of IE), go to the Firefox website and follow the instructions to download and run the installer for the latest version of Firefox. Depending on how you install Firefox, the first time you run it, you may be asked whether you want to import bookmarks from Internet Explorer. You may also be asked whether you want to make Firefox your default browser. Firefox is a little different from IE in that it has a search bar in addition to the address bar. In fact, you can type search terms into the address bar or the search bar, and Firefox brings up your preferred search engine to look for them. 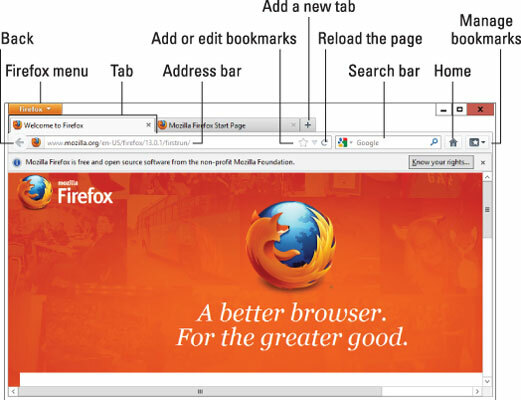 Setting a home page in Firefox is similar to setting one in IE. To get to the right place, click the Firefox menu (in the upper-left corner), choose Options, and then Options again. Home page settings are on the General tab. To start a Private Browsing session, click the Firefox menu and choose Start Private Browsing. Start Firefox on the desktop. Click the Firefox menu button and choose Options, and then Options again. At the top, click the Privacy icon. 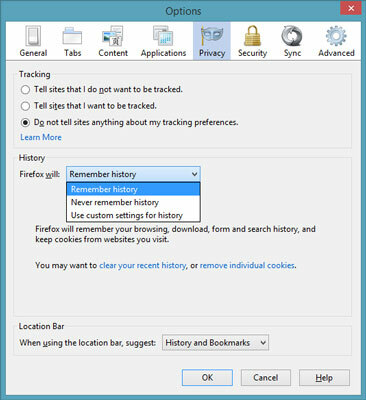 In the Firefox Will box, choose Use Custom Settings for History. Then select the box marked Always Use Private Browsing Mode. If you want to turn on Do Not Track, select the Tell Websites I Do Not Want to Be Tracked check box. Admittedly, DNT doesn’t do much right now, but it doesn’t hurt, and may actually block a few sites. The next time you start Firefox, it’ll be in Private Browsing mode. If you ever want to drop back into regular mode, click the Firefox menu and choose Stop Private Browsing. Firefox handles bookmarks differently from Internet Explorer. (In IE, they’re called Favorites. Same thing.) The easiest way to understand Firefox bookmarks? Start with the Unsorted Bookmarks folder. In Firefox, go to the site you want to bookmark and tap or click the Bookmark icon (the big star) on the right edge of the address bar. This bookmarks the page and puts the bookmark in a kind of All Other folder named Unsorted Bookmarks. If you’d rather stick your bookmark in a place where you can find it later or assign a tag to it, click the bookmark star once again. Firefox opens its Edit This Bookmark dialog box. Type any tags you want to associate with the bookmark in the Tags box, at the bottom. Tags help you find things on the address bar. For example, if you assign a Stuxnet tag to the bookmark, typing stux in the address bar brings up this particular bookmark. To organize your bookmarks into folders or place bookmarks on the Bookmark bar, click the down arrow to the right of the Folder box. Firefox lets you choose the bookmark folder that should contain your new bookmark or create a new folder to hold the bookmark. If you create a new folder, you can leave it in the Unsorted Bookmarks folder, but if you want to make it more readily accessible from the Bookmarks menu, click and drag the new folder in the Edit This Bookmark dialog box so that the folder appears under the Bookmarks Menu folder. If you want to put the new folder on the Bookmarks toolbar, to the right of the Latest Headlines button, click and drag it to the Bookmarks Toolbar folder. 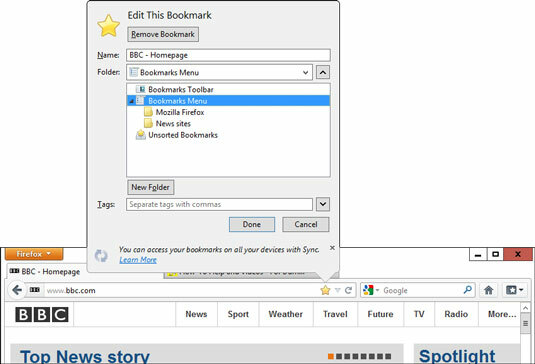 The Bookmarks toolbar is convenient, but it takes up precious space on the screen. Many people prefer to work with the Bookmarks icon, on the far right. After the folder has been created (and, optionally, located on the Bookmarks menu or the Bookmarks toolbar), you can place any bookmark in the folder by double-clicking the bookmark star. One of the best reasons for choosing Firefox over IE and Chrome is the incredible abundance of add-ons. If you can think of something to do with a browser, chances are good there’s already an add-on that’ll do it. An enormous cottage industry has grown up around Firefox. The Firefox people made it relatively easy to extend the browser itself. As a result, tens of thousands of add-ons cover an enormous range of capabilities. To search for add-ons, mosey over to Mozilla Add-Ons screen. 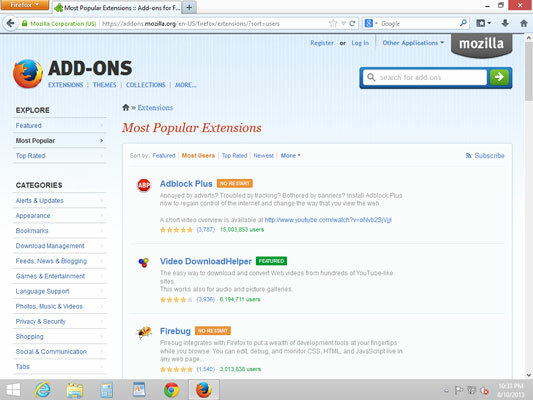 You can search for the add-ons recommended by Firefox itself or look for the most frequently downloaded add-ons.